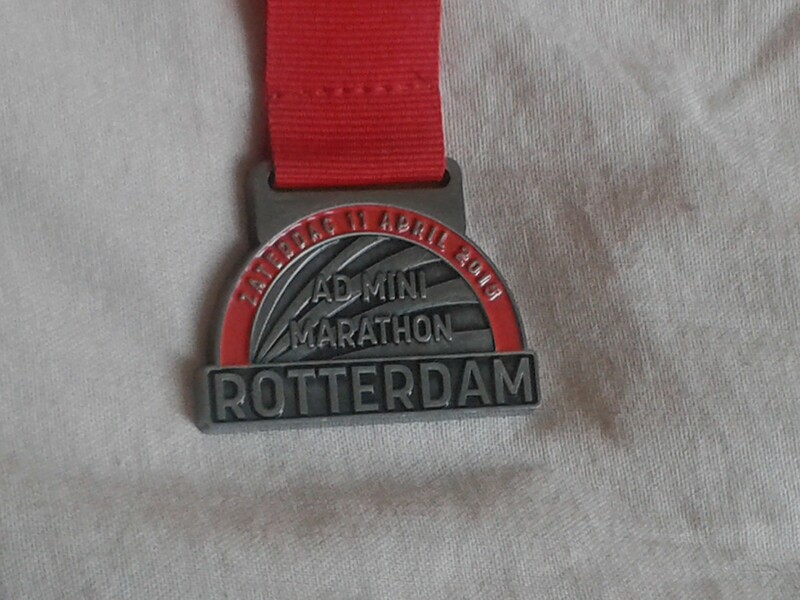 The first race I ran this running season was the Mini Marathon in Rotterdam with almost 2000 other runners. This 4.2 km race has the same finish as the Rotterdam Marathon. The weather was not very cooperative on race day. There were showers before the race, but I was hoping it would be dry during the race. While waiting for the start it was already starting to drizzle again, which really cools you down while you’re standing still. The race route itself was nice, but not always very clearly marked. And due to the weather there weren’t that many supporters either. Not long after the start it really started to rain. So by the time I finished I was soaked and really wanted to get home. But the organization did not offer any bag drop-off so the only things I had with me were in my pockets. Luckily it managed to keep my mobile phone semi-dry, but I did not have any dry clothes with me. So in the end it took me an hour to get home and by that time I was chilled to the bone and it took me at least another hour to get somewhat warm again. I did run a good time of 33:33 and I did enjoy the route, but if I were to run this race again I would hope for some better weather and a place to keep some dry clothes, just in case.